Patient presented to my office on 9/17/12 with the chief complaint of a recently placed crown on tooth #10 that had chipped. She said that the treating dentist, Dr. R, said that it could not be fixed and she would need to replace the veneer at her cost. Not satisfied with that response, she consulted another local dentist who gave her the same information. Still frustrated with her situation, she searched the internet and found an article that I published on repairing chipped porcelain. After speaking with her on the phone about her problem, she appointed for a consultation. At that appointment she presented with the history of the recent dental treatment she received from Dr. R. She described how Dr. R had told her that her occlusion (bite) was the major reason for her jaw pain. The treatment presented to her was to re-establish a bite using a transcutaneous electrical neural stimulator (TENS unit) that would create a new bite for her with an orthotic mouthpiece that would be worn 24 hours a day. She said it was a bulky appliance that was not comfortable to wear but wore it to comply with the treatment. After wearing the orthotic for a period of time, Dr. R prepared 12 teeth (including 2 implant abutments) for crowns. Temporary crowns were placed in the interim while the crowns were fabricated at the dental laboratory. When the temporaries were placed, she found it difficult to chew food and speak but just thought it was an interim problem and probably was because they were just "temporaries". 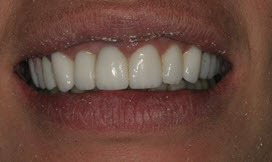 After several weeks, she said that she returned to Dr. R's office for the placement of the permanent crowns. After the crowns were permanently cemented, she was able to see the restorations in the mirror. Her initial reaction was that the crowns were too long and too white. She was never given the opportunity to approve of the shade of the crowns during the fabrication process. After commenting on these two concerns, she was told by Dr. R that the shade was right as well as the length and she would get used to it. The problem was that she couldn't get used to the length and still thought the crowns were too white and returned to the dental office expressing her concerns. She was told that everything was done right and she would just have to get used to it. During my initial examination I found her having difficulty in pronouncing "f", "v" and "s" sounds. It was noted during phonetic testing that because of the increased length of the maxillary anterior teeth, the incisal edges were encroaching on her lower lip causing problems with the pronunciation of the aforementioned sounds. I then discussed how shortening the length of the crowns could possibly solve her phonetic problem and prevent further fracturing of the ceramic crowns and veneers. The reduction in length would also resolve the chipped veneer problem since it was located on the edge of the crown and that chipped portion would be removed as the length of the crowns shorten. As far as the problem with the crowns being too white, the only solution was re-place them using a more natural shade of porcelain. I also found a lack of posterior separation when her lower jaw moved in a protrusive movement due to the lack of anterior guidance. This means that when her lower jaw was moved to an edge-to-edge position, her back teeth did not separate. Her lower anterior teeth were severely worn and lacked the necessary length for the separation of the posterior teeth to occur. I asked Patient if Dr. R had recommended treatment addressing this situation. She did not remember if this problem was discussed. It is paramount that the restoring dentist creates harmony with the dental and neuromuscular envelopes of function. Failure to achieve this harmony can lead to catastrophic failure of the restorations, interference in chewing, tooth mobility, fremitus, hypersensitivity, TMJ disturbances, hyper-muscle activity, loss of supportive bone, and excessive wear of the dentition (Dawson PE: Evaluation, diagnosis and treatment of occlusal problems. 2nd ed. St. Louis: Mosby; 1989). I then recommended that she return to Dr. R with the information we discussed and ask that he alter the length. Patient called weeks later and said that Dr. R told her the crowns were fine and he would not make any changes. She asked if I would see her and help her with her teeth because they were still causing her difficulty in speaking and chewing. Additionally, she said that she was still having jaw, neck and shoulder muscle pain. She was very unhappy and didn't know what to do. She was appointed to return to my office. 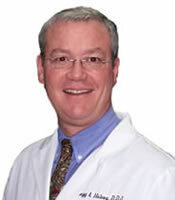 Dr. Gregg Helvey, DDS, MAGD, has practiced General Dentistry for over 38 years. Specializing in Restorative and Aesthetic Dentistry, he is part of an elite group of dentists who are also skilled dental laboratory ceramists. This combination of experience as both a dentist and a laboratory technician has aided in the development of unique restorative laboratory procedures.